Everest Panorama trekking takes you up high towards the trail to Thame, Khumjung and Tenboche monastery. This is relatively less difficult trek than Everest trek and it is short as well. This trek offers you an excellent view of world’s some of highest peaks such as Everest, Lhotse , Thamserku, Ama Dablam are among others. We take a flight from Kathmandu to Lukla. Then we trek up to Namche bazzar, Tyanboche, Khumjung village. This trek offers you an opportunity to observe a charming settlement of Sherpa village. Everest Panorama trekking also gives you more information about the Sherpa people and their amazing life style. You will also learn many things about the culture of Sherpa people. Himalayan Monastery Trekking is pretty much popular among those who come to Nepal first time for trekking. Moreover, Mount Everest popular Trekking is suitable for those who can’t manage enough time for making longer trekking in high mountains. You will come to notice natural beauty, geological brilliance and profound diverse culture. Sherpa people who are residing below the mountain believe that all Things Mountains, plants and animals are sacred for them. The main objective of this trek is to see world’s highest mountain, the Everest, Sherpa village and of course the world famous mountaineers. A flight to Lukla and a landing on a steep mountain runway brings us to the start of our trek at the village of Lukla [2850m]. After meeting the crew, we head up the Dudh Koshi Valley on a well-marked trail and then stay overnight in Phakding. We stay overnight at guesthouse. From Phakding, we cross and re-cross the river on high suspension bridges. Beyond Monjo is the entrance of the Sagarmatha National Park which was set-up in order to protect and preserve the fragile mountain environment. We then take a steep hike to Namche. If the weather is clear, we get the first glimpse of Mt Everest. Namche is the main trading village in the Khumbu and has a busy Saturday market - a meeting place for the Hindu traders from the lowlands and the Tibetan yak caravans that have crossed the glaciated Nangpa La. . We stay overnight at guesthouse. 05 Trekking in Namche Bazzar and rest day. From Namche the route turns west and the trail is almost level as we head up the Bhote Kosi Valley , once a popular trading route into Tibet . Along the way we pass many prayer flags and mani stones, all indicative of the Tibetan Buddhist culture of this area. After descending to the Bhote Kosi the trail climbs steeply to Thame. From here there are good views of the peaks of Teng Kangpoche and Kwangde. 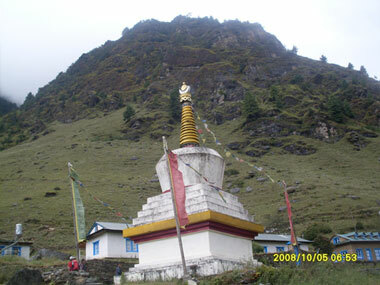 To the north is the Nangpa La, the pass leading to Tibet . Thame Gompa is situated above the village overlooking the valley and is the site for the spring celebrations of the Mani Rimdu festival. We stay overnight at guesthouse. we retrace our route down the Bhote Kosi Valley towards Namche and branch off to follow a quiet trail to Khumjung. It is a picturesque village which also has its own gompa at the top end of town. From our camping spot, we have excellent views of Thamserku, Kantega and Ama Dablam. . We stay overnight at guesthouse. Now we descend back along the valley to Phortse, a village which seems unaffected by the advent of trekkers. The quiet rhythm of life continues as it has always done in the village. We stay overnight at guesthouse. From Phortse, passing through fields, a stream and two white Chortens, we descend along the trail to Pangboche. It takes a couple of hours to reach Pangboche. Our highest trekking point is Pangboche (3985m). Its highlight is the charming and unspoiled monastery. The monastery is believed to have been founded around 1667 which makes it the oldest Sherpa gompa in the Khumbu. . We stay overnight at guesthouse. While on our way down to Tengboche, we see many beautiful sights of rhododendron bushes with beautiful birds and superb mountain scenery. 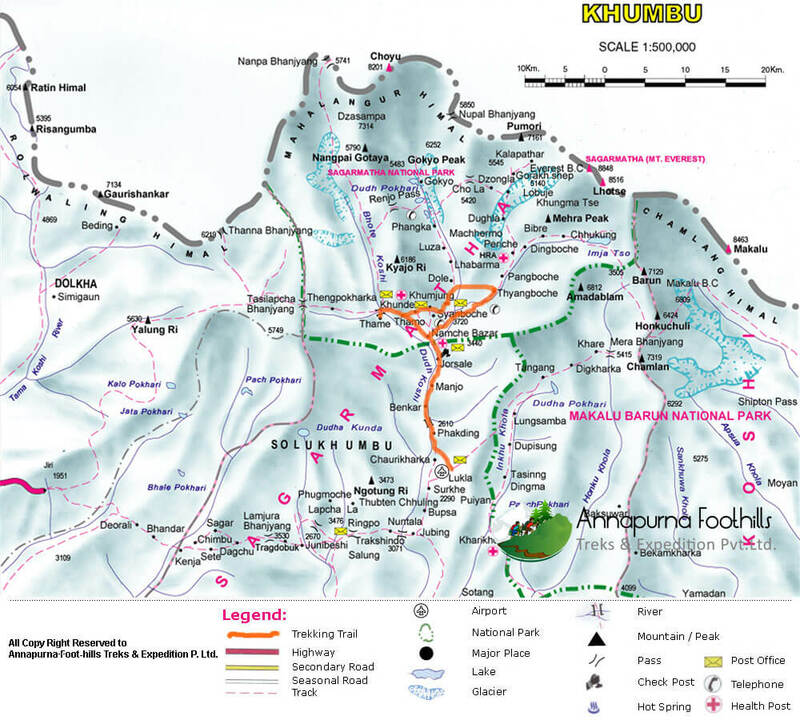 Tengboche is famous for its legendary monastery, the largest in the Khumbu. A spectacular panorama of Everest, Lhotse and Ama Dablam rising in the horizon can be seen from this village. . We stay overnight at guesthouse. From Tengboche we descend to the bridge over the Dudh Kosi at Phunki Tenga, where there are water driven prayer wheels, before making our way back to Namche. We stay overnight at guesthouse. Trek from Namche Bazaar to Phakding (2652m.) and it takes about four hours. The trails descend steeply for early one and half hours. After that, the path has small ups and down to Phakding through Monjo. . We stay overnight at guesthouse. Trek from Phakding to Lukla [2886m] and it takes about three hours. Your final day's trekking follows the Dudh Kosi back down to Lukla. The trail then continues back towards Lukla, where we will reconfirm our flight tickets for the next day and spend the night. This last evening in the mountains is the ideal opportunity for a farewell party with the sherpa guides and porters, where you can sample some chhang, try Sherpa dancing and look back on a memorable trekking experience and staffs are expecting for precious Tips. . We stay overnight at guesthouse.